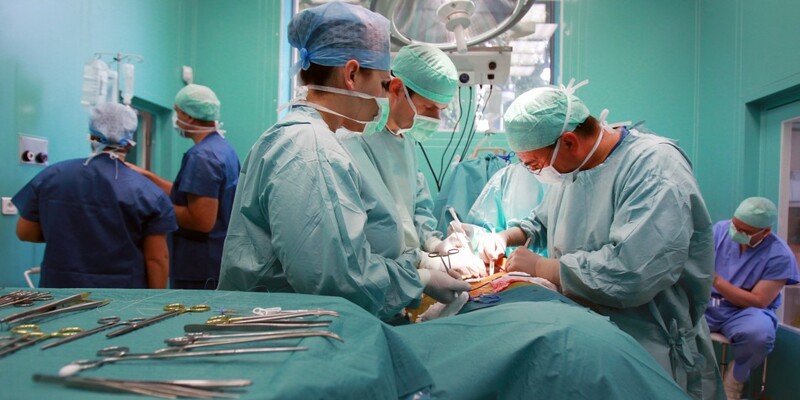 There has been significant improvement in the perioperative results following liver resection, mainly due to techniques that help reduce blood loss during the operation. Extent of liver resection required in HCC for optimal oncologic results is still controversial. On this basis, the rationale for anatomically removing the entire segment or lobe bearing the tumor, would be to remove undetectable tumor metastases along with the primary tumor. Several retrospective studies and meta-analyses have shown that anatomical resections are safe in patients with HCC and liver dysfunction, and may offer a survival benefit. It should be noted, that most studies are biased, as non-anatomical resections are more commonly performed in patients with more advanced liver disease, which affects both recurrence and survival. It therefore remains unclear whether anatomical resections have a true long-term survival benefit in patients with HCC. Some authors have suggested that anatomical resections may provide a survival benefit in tumors between 2 and 5 cm. The rational is that smaller tumors rarely involve portal structures, and in larger tumors presence of macrovascular invasion and satellite nodules would offset the effect of aggressive surgical approach. Another important predictor of local recurrence is margin status. Generally, a tumor-free margin of 1 cm is considered necessary for optimal oncologic results. A prospective randomized trial on 169 patients with solitary HCC demonstrated that a resection margin aiming at 2 cm, safely decreased recurrence rate and improved long-term survival, when compared to a resection margin aiming at 1 cm. Therefore, wide resection margins of 2 cm is recommended, provided patient safety is not compromised. Intraoperative ultrasound (IOUS) is an extremely important tool when performing liver resections, specifically for patients with HCC and compromised liver function. IOUS allows for localization of the primary tumor, detection of additional tumors, satellite nodules, tumor thrombus, and define relationship with bilio-vascular structures within the liver. Finally, intraoperative US-guided injection of dye, such as methylene-blue, to portal branches can clearly define the margins of the segment supplied by the portal branch and facilitate safe anatomical resection. The anterior approach to liver resection is a technique aimed at limiting tumor manipulation to avoid tumoral dissemination, decrease potential for blood loss caused by avulsion of hepatic veins, and decrease ischemia of the remnant liver caused by rotation of the hepatoduodenal ligament. This technique is described for large HCCs located in the right lobe, and was shown in a prospective, randomized trial to reduce frequency of massive bleeding, number of patients requiring blood transfusions, and improve overall survival in this setting. This approach can be challenging, and can be facilitated by the use of the hanging maneuver. Multiple studies have demonstrated that blood loss and blood transfusion administration are significantly associated with both short-term perioperative, and long-term oncological results in patients undergoing resection for HCC. This has led surgeons to focus on limiting operative blood loss as a major objective in liver resection. Transfusion rates of <20 % are expected in most experienced liver surgery centers. Inflow occlusion, by the use of the Pringle Maneuver represents the most commonly performed method to limit blood loss. Cirrhotic patients can tolerate total clamping time of up to 90 min, and the benefit of reduced blood loss outweighs the risks of inflow occlusion, as long as ischemia periods of 15 min are separated by at least 5 min of reperfusion. Total ischemia time of above 120 min may be associated with postoperative liver dysfunction. Additional techniques aimed at reducing blood loss include total vascular isolation, by occluding the inferior vena cava (IVC) above and below the liver, however, the hemodynamic results of IVC occlusion may be significant, and this technique has a role mainly in tumors that are adjacent to the IVC or hepatic veins. Anesthesiologists need to assure central venous pressure is low (below 5 mmHg) by limiting fluid administration, and use of diuretics, even at the expense 470 N. Lubezky et al. of low systemic pressure and use of inotropes. After completion of the resection, large amount of crystalloids can be administered to replenish losses during parenchymal dissection. Laparoscopic liver resections were shown to provide benefits of reduced surgical trauma, including a reduction in postoperative pain, incision-related morbidity, and shorten hospital stay. Some studies have demonstrated reduced operative bleeding with laparoscopy, attributed to the increased intra-abdominal pressure which reduces bleeding from the low-pressured hepatic veins. Additional potential benefits include a decrease in postoperative ascites and ascites-related wound complications, and fewer postoperative adhesions, which may be important in patients undergoing salvage liver transplantation. There has been a delay with the use of laparoscopy in the setting of liver cirrhosis, due to difficulties with hemostasis in the resection planes, and concerns for possible reduction of portal flow secondary to increased intraabdominal pressure. However, several recent studies have suggested that laparoscopic resection of HCC in patients with cirrhosis is safe and provides improved outcomes when compared to open resections. Resections of small HCCs in anterior or left lateral segments are most amenable for laparoscopic resections. Larger resections, and resection of posterior-sector tumors are more challenging and should only be performed by very experienced surgeons. Long-term oncological outcomes of laparoscopic resections was shown to be equivalent to open resections on retrospective studies , but prospective studies are needed to confirm these findings. In recent years, robotic-assisted liver resections are being explored. Feasibility and safety of robotic-assisted surgery for HCC has been demonstrated in small non-randomized studies, but more experience is needed, and long-term oncologic results need to be studied, before widespread use of this technique will be recommended. The pre-operative options for inducing atrophy of the resected part and hypertrophy of the FLR, mainly PVE, were described earlier. Associating Liver Partition with Portal vein ligation for Staged hepatectomy (ALPPS) is another surgical option aimed to induce rapid hypertrophy of the FLR in patients with HCC. This technique involves a 2-stage procedure. In the first stage splitting of the liver along the resection plane and ligation of the portal vein is performed, and in the second stage, performed at least 2 weeks following the first stage, completion of the resection is performed. 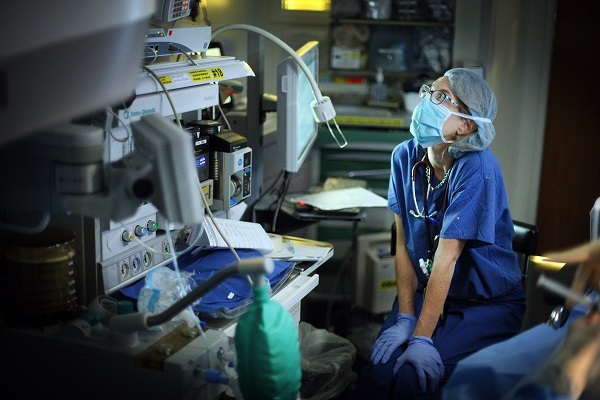 Patient safety is a major concern, and some studies have reported increased morbidity and mortality with the procedure. Few reports exist of this procedure in the setting of liver cirrhosis. Currently, the role of ALPPS in the setting of HCC and liver dysfunction needs to be better delineated before more widespread use is recommended. Gallbladder cancer is uncommon disease, although it is not rare. Indeed, gallbladder cancer is the fifth most common gastrointestinal cancer and the most common biliary tract cancer in the United States. The incidence is 1.2 per 100,000 persons per year. It has historically been considered as an incu-rable malignancy with a dismal prognosis due to its propensity for early in-vasion to liver and dissemination to lymph nodes and peritoneal surfaces. Patients with gallbladder cancer usually present in one of three ways: (1) advanced unresectable cancer; (2) detection of suspicious lesion preoperatively and resectable after staging work-up; (3) incidental finding of cancer during or after cholecystectomy for benign disease. Although, many studies have suggested improved survival in patients with early gallbladder cancer with radical surgery including en bloc resection of gallbladder fossa and regional lymphadenectomy, its role for those with advanced gallbladder cancer remains controversial. First, patients with more advanced disease often require more extensive resections than early stage tumors, and operative morbidity and mortality rates are higher. Second, the long-term outcomes after resection, in general, tend to be poorer; long-term survival after radical surgery has been reported only for patients with limited local and lymph node spread. Therefore, the indication of radical surgery should be limited to well-selected patients based on thorough preoperative and intra-operative staging and the extent of surgery should be determined based on the area of tumor involvement. abdomen for evidence of discontinuous liver disease or peritoneal metastasis and to avoid unnecessary laparotomy. Weber et al. reported that 48% of patients with potentially resectable gallbladder cancer on preoperative imaging work-up were spared laparotomy by discovering unresectable disease by laparoscopy. Laparoscopic cholecystectomy should be avoided when a preoperative cancer is suspected because of the risk of violation of the plane between tumor and liver and the risk of port site seeding. The goal of resection should always be complete extirpation with microscopic negative margins. Tumors beyond T2 are not cured by simple cholecystectomy and as with most of early gallbladder cancer, hepatic resection is always required. The extent of liver resection required depends upon whether involvement of major hepatic vessels, varies from segmental resection of segments IVb and V, at minimum to formal right hemihepatectomy or even right trisectionectomy. The right portal pedicle is at particular risk for advanced tumor located at the neck of gallbladder, and when such involvement is suspected, right hepatectomy is required. Bile duct resection and reconstruction is also required if tumor involved in bile duct. However, bile duct resection is associated with increased perioperative morbidity and it should be performed only if it is necessary to clear tumor; bile duct resection does not necessarily increase the lymph node yield. Portal vein Embolizations (PVE) is commonly used in the patients requiring extensive liver resection but have insufficient Future Liver Remanescent (FLR) volume on preoperative testing. The procedure involves occluding portal venous flow to the side of the liver with the lesion thereby redirecting portal flow to the contralateral side, in an attempt to cause hypertrophy and increase the volume of the FLR prior to hepatectomy. PVE was first described by Kinoshita and later reported by Makuuchi as a technique to facilitate hepatic resection of hilar cholangiocarcinoma. The technique is now widely used by surgeons all over the world to optimize FLR volume before major liver resections. PVE works because the extrahepatic factors that induce liver hypertrophy are carried primarily by the portal vein and not the hepatic artery. The increase in FLR size seen after PVE is due to both clonal expansion and cellular hypertrophy, and the extent of post-embolization liver growth is generally proportional to the degree of portal flow diversion. The mechanism of liver regeneration after PVE is a complex phenomenon and is not fully understood. 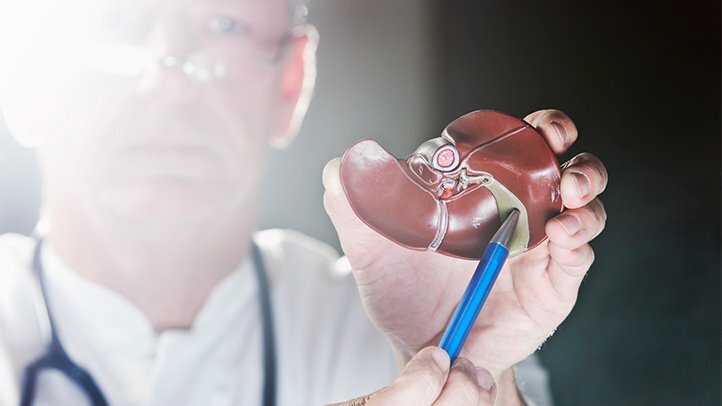 Although the exact trigger of liver regeneration remains unknown, several studies have identified periportal inflammation in the embolized liver as an important predictor of liver regeneration. PVE is technically feasible in 99% of the patients with low risk of complications. Studies have shown the FLR to increase by a median of 40–62% after a median of 34–37 days after PVE, and 72.2–80% of the patients are able to undergo resection as planned. It is generally indicated for patients being considered for right or extended right hepatectomy in the setting of a relatively small FLR. It is rarely required before extended left hepatectomy or left trisectionectomy, since the right posterior section (segments 6 and 7) comprises about 30% of total liver volume. PVE is usually performed through percutaneous transhepatic access to the portal venous system, but there is considerable variability in technique between centers. The access route can be ipsilateral (portal access at the same side being resected) with retrograde embolization or contralateral (portal access through FLR) with antegrade embolization. The type of approach selected depends on a number of factors including operator preference, anatomic variability, type of resection planned, extent of embolization, and type of embolic agent used. Many authors prefer ipsilateral approach especially for right-sided tumors as this technique allows easy catheterization of segment 4 branches when they must be embolized and also minimizes the theoretic risk of injuring the FLR vasculature or bile ducts through a contralateral approach and potentially making a patient ineligible for surgery. However, majority of the studies on contralateral PVE show it to be a safe technique with low complication rate. Di Stefano et al. reported a large series of contralateral PVE in 188 patients and described 12 complications (6.4%) only 6 of which could be related to access route and none precluded liver resection. Site of portal vein access can also change depending on the choice of embolic material selected which can include glue, Gelfoam, n-butyl-cyanoacrylate (NBC), different types and sizes of beads, alcohol, and nitinol plus. All agents have similar efficacy and there are no official recommendations for a particular type of agent. Proponents of PVE believe that there should be very little or no tumor progression during the 4–6 week wait period for regeneration after PVE. Rapid growth of the FLR can be expected within the first 3–4 weeks after PVE and can continue till 6–8 weeks. Results from multiple studies suggest that 8–30% hypertrophy over 2–6 weeks can be expected with slower rates in cirrhotic patients. Most studies comparing outcomes after major hepatectomy with and without preoperative PVE report superior outcomes with PVE. Farges et al. demonstrated significantly less risk of postoperative complications, duration of intensive care unit, and hospital stay in patients with cirrhosis who underwent right hepatectomy after PVE compared to those who did not have preoperative PVE. The authors also reported no benefit of PVE in patients with a normal liver and FLR >30%. Abulkhir et al. reported results from a meta-analysis of 1088 patients undergoing PVE and showed a markedly lower incidence of Post Hepatectomy Liver Failure (PHLF) and death compared to series reporting outcomes after major hepatectomy in patients who did not undergo PVE. All patients had FLR volume increase, and 85% went on to have liver resection after PVE with a PHLF incidence of 2.5% and a surgical mortality of 0.8%. Several studies looking at the effect of systemic neoadjuvant chemotherapy on the degree of hypertrophy after PVE show no significant impact on liver regeneration and growth. The volumetric response to PVE is also a very important factor in understanding the regenerative capacity of a patient’s liver and when used together with FLR volume can help identify patients at risk of poor postsurgical outcome. Ribero et al. demonstrated that the risk of PHLF was significantly higher not only in patients with FLR ≤ 20% but also in patients with normal liver who demonstrated ≤5% of FLR hypertrophy after PVE. The authors concluded that the degree of hypertrophy >10% in patients with severe underlying liver disease and >5% in patients with normal liver predicts a low risk of PHLF and post-resection mortality. Many authors do not routinely offer resection to patients with borderline FLR who demonstrate ≤5% hypertrophy after PVE. Careful analysis of outcome based on liver remnant volume stratified by underlying liver disease has led to recommendations regarding the safe limits of resection. The liver remnant to be left after resection is termed the future liver remnant (FLR). For patients with normal underlying liver, complications, extended hospital stay, admission to the intensive care unit, and hepatic insufficiency are rare when the standardized FLR is >20% of the TLV. For patients with tumor-related cholestasis or marked underlying liver disease, a 40% liver remnant is necessary to avoid cholestasis, fluid retention, and liver failure. Among patients who have been treated with preoperative systemic chemotherapy for more than 12 weeks, FLR >30% reduces the rate of postoperative liver insufficiency and subsequent mortality. 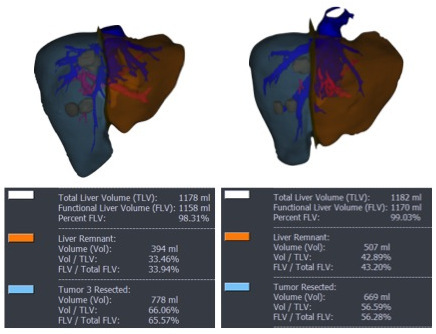 Thus, the standardized FLR (sFLR) volume calculation uses the measured FLR volume from CT volumetry as the numerator and the calculated TLV as the denominator: Standardized FLR (sFLR) = measured FLR volume/TLV Calculating the standardized TLV corrects the actual liver volume to the individual patient’s size and provides an individualized estimate of that patient’s postresection liver function. In the event of an inadequate FLR prior to major hepatectomy, preoperative liver preparation may include portal vein embolization (PVE). This page provides links to prerecorded webcasts of surgical procedures. These are actual operations performed at medical centers in the Brazil. Please note that you cannot send in questions by email, though the webcast may say that you can, because you are not seeing these videos live. The videos open in a second window. If you have a pop-up blocker, you will need to disable it to view the programs. In both the UK and the USA the annual death rate due to inguinal and femoral hernia has decreased in the last two to three decades. In the UK, deaths for inguinal and femoral hernia declined from 22 to 55% respectively from 1975 to 1990. The annual deaths in the USA per 100,000 population for patients with hernia and intestinal obstruction decreased from 5.1 in 1968 to 3.0 in 1988. For inguinal hernia with obstruction, 88% of patients underwent surgery with a mortality rate of 0.05%. These figures could be interpreted as showing that elective groin hernia surgery has reduced overall mortality rates. In support of this contention is the fact that strangulation rates are lower in the USA than in the UK, which could be a consequence of the three times higher rate of elective hernia surgery in the USA. Even so, the available statistics show that rates of elective hernia surgery in the USA per 100,000 population fell from 358 to 220 between 1975 and 1990, although this may be an artifact of the data collection systems rather than a real decline. During the period 1991–1992, 210 deaths occurring following inguinal hernia repair and 120 deaths following femoral hernia repair were investigated by the UK National Confidential Enquiry Into Perioperative Deaths. This enquiry is concerned with the quality of delivery of surgery, anesthesia, and perioperative care. Expert advisers compare the records of patients who have died with index cases. In this group of 330 patients many were elderly (45 were aged 80–89 years) and significantly infirm unfit; 24 were ASA grade III and 21 ASA grade IV. Postoperative mortality was attributed to preexisting cardiorespiratory problems in the majority of cases. In a nationwide study in Denmark of 158 patients dying after acute groin hernia repair, Kjaergaard et al. also found that these patients were old (median age 83 years) and fragile (>80% with significant comorbidity), with frequent delay in diagnosis and subsequent treatment. Clearly this group of patients requires high-quality care by an experienced surgeon and anesthetist with skills equivalent to that of the ASA grade of the patient. Postoperative care should necessarily take place in a high-dependency unit or intensive therapy unit; this may necessitate transfer of selected patients to appropriate hospitals and facilities. Sensible decisions must be made in consultation with relatives of extremely elderly, frail, or moribund patients to adopt a humane approach, which may rule out interventional surgery. Forty percent of patients with femoral hernia are admitted as emergency cases with strangulation or incarceration, whereas only 3% of patients with direct inguinal hernias present with strangulation. This clearly has implications for the prioritization on waiting lists when these types of hernia present electively to outpatient clinics. A groin hernia is at its greatest risk of strangulation within 3 months of its onset. For inguinal hernia at 3 months after presentation, the cumulative probability of strangulation is 2.8%, rising to 4.5% after 2 years. For femoral hernia the risk is much higher, with a 22% probability of strangulation at 3 months after presentation rising to 45% at 21 months. Right-sided hernias strangulate more frequently than left-sided hernias; this is possibly related to mesenteric anatomy. In a randomized trial, evaluating an expectative approach to minimally symptomatic inguinal hernias, Fitzgibbons et al. in the group of patients randomized to watchful waiting found a risk of an acute hernia episode of 1.8 in 1,000 patient years. In another trial, O’Dwyer and colleagues, randomizing patients with painless inguinal hernias to observation or operation, found two acute episodes in 80 patients randomized to observation. In both studies, a large percentage of patients randomized to nonoperative care were eventually operated due to symptoms. Neuhauser, who studied a population in Columbia where elective herniorrhaphy was virtually unobtainable, found an annual rate of strangulation of 0.29% for inguinal hernias. Diagnosis is based on symptoms and signs supplemented by diagnostic imaging when indicated. Pain over the hernia site is invariable, and obstruction with strangulation of intestine will cause colicky abdominal pain, distension, vomiting, and constipation. Physical examination may reveal degrees of dehydration with or without CNS depression, especially in the elderly if uremia is present, together with abdominal signs of intestinal obstruction. Femoral hernias can be easily missed, especially in the obese female, and a thorough examination should be performed in order to make the correct diagnosis. Frequently, however, physical examination alone is insuf fi ciently accurate to con fi rm the presence of a strangulating femoral hernia vs. lymphadenopathy vs. a lymph node abscess. In these instances, one may elect to perform radiographic studies such as an ultrasound or a CT scan on an urgent or emergent basis. The choice of incision will depend on the type hernia if the diagnosis is confi dent. When the diagnosis is in doubt, a half Pfannenstiel incision 2 cm above the pubic ramus, extending laterally, will give an adequate approach to all types of femoral or inguinal hernia. The fundus of the hernia sac can then be approached and exposed and an incision made to expose the contents of the sac. This will allow determination of the viability of its contents. Nonviability will necessitate conversion of the transverse incision into a laparotomy incision followed by release of the constricting hernia ring, reduction of the contents of the sac, resection, and reanastomosis. Precautions should be taken to avoid contamination of the general peritoneal cavity by gangrenous bowel or intestinal contents. In the majority of cases, once the constriction of the hernia ring has been released, circulation to the intestine is reestablished and viability returns. Intestine that is initially dusky, aperistaltic, or dull in hue may pink up with a short period of warming with damp packs once the constriction band is released. If viability is doubtful, resection should be performed. Resection rates are highest for femoral or recurrent inguinal hernias and lowest for inguinal hernias. Other organs, such as bladder or omentum, should be resected, as the need requires. After peritoneal lavage and formal closure of the laparotomy incision, specific repair of the groin hernia defect should be performed. In this situation prosthetic mesh should not be used in an operative fi eld that has been contaminated and in which there is a relatively high risk of wound infection. The hernia repair should follow the general principles for elective hernia repair. It should be kept in mind, that in this group of predominantly frail and elderly patients with a very high postoperative mortality risk, the primary objective of the operation is to stop the vicious cycle of strangulation, and only secondary to repair the hernia defect. The risk of an acute groin hernia episode is of particular relevance, when discussing indication for operation of painless or minimally symptomatic hernias. A sensible approach in groin hernias would be, in accordance with the guidelines from the European Hernia Society to advise a male patient, that the risk of an acute operation, with an easily reducible (“disappears when lying down”) inguinal hernia with little or no symptoms, is low and that the indication for operation in this instance is not absolute, but also inform, that usually the hernia after some time will cause symptoms, eventually leading to an operation. In contrast, female patients with a groin hernia, due to the high frequency of femoral hernias and a relatively high risk of acute hernia episodes, should usually be recommended an operation. There are many local and systemic factors that affect wound healing. The physician should be actively working to correct any abnormality that can prevent or slow wound healing. 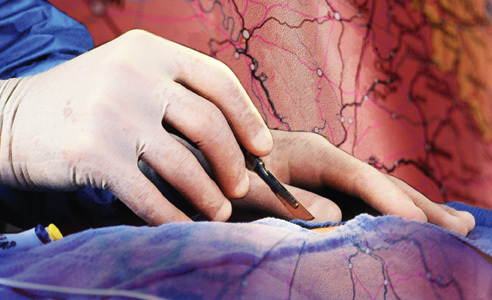 A health care provider can improve wound healing by controlling local factors. He or she must clean the wound, debride it, and close it appropriately. Avulsion or crush wounds below under general management of wounds) need to be debrided until all nonviable tissue is removed. Grossly contaminated wounds should be cleaned as completely as possible to remove particulate matter (foreign bodies) and should be irrigated copiously. Bleeding must be controlled to prevent hematoma formation, which is an excellent medium for bacterial growth. Hematoma also separates wound edges, preventing the proper contact of tissues that is necessary for healing. Radiation affects local wound healing by causing vasculitis, which leads to local hypoxia and ischemia. Hypoxia and ischemia impede healing by reducing the amount of nutrients and oxygen that are available at the wound site. 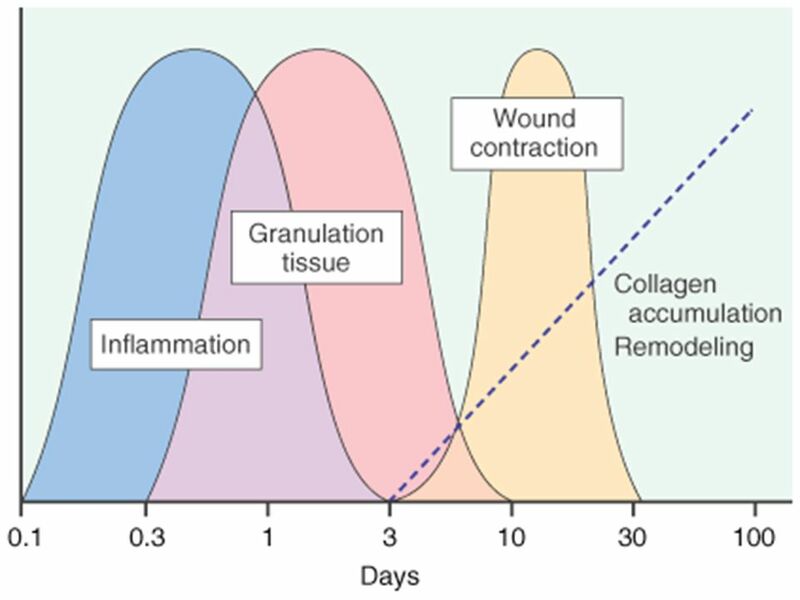 Infection decreases the rate of wound healing and detrimentally affects proper granulation tissue formation, decreases oxygen delivery, and depletes the wound of needed nutrients. Care must be taken to clean the wound adequately. All wounds have some degree of contamination, if the body is able to control bacterial proliferation in a wound, that wound will heal. The use of cleansing agents (the simplest is soap and water) can help reduce contamination. A wound that contains the highly virulent streptococci species should not be closed. Physicians should keep in mind the potential for Clostridium tetani in wounds with devitalized tissue and use the proper prophylaxis. formation. 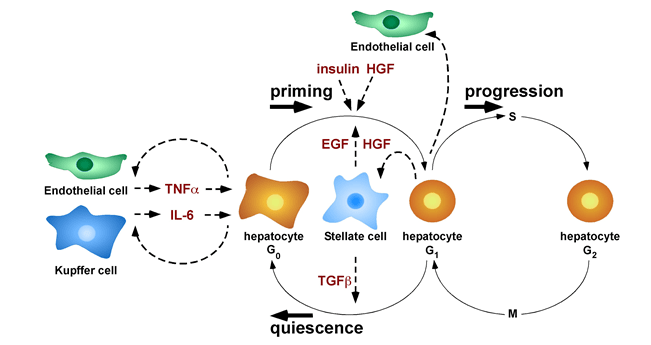 Hyperglycemia also inhibits fibroblast and endothelial cell proliferation within the wound. Medications will also affect wound healing. For example, steroids blunt the inflammatory response, decrease the available vitamin A in the wound, and alter the deposition and remodeling of collagen. Chronic illness (immune deficiency, cancer, uremia, liver disease, and jaundice) will predispose to infection, protein deficiency, and malnutrition, which, as noted previously, can affect wound healing. Smoking has a systemic effect by decreasing the oxygencarrying capacity of hemoglobin. Smoking may also decrease collagen formation within a wound. Hypoxia results in a decrease in oxygen delivery to a wound and retards healing. The abdomen is the lower part of the trunk below the diaphragm. Its walls surround a large cavity called the abdominal cavity. The abdominal cavity is much more extensive than what it appears from the outside. It extends upward deep to the costal margin up to the diaphragm and downward within the bony pelvis. Thus, a considerable part of the abdominal cavity is overlapped by the lower part of the thoracic cage above and by the bony pelvis below. The abdominal cavity is subdivided by the plane of the pelvic inlet into a larger upper part, i.e., the abdominal cavity proper, and a smaller lower part, i.e., the pelvic cavity. Clinically the importance of the abdomen is manifold. To the physician, the physical examination of the patient is never complete until he/she thoroughly examines the abdomen. To the surgeon, the abdomen remains an enigma because in number of cases the cause of abdominal pain and nature of abdominal lump remains inconclusive even after all possible investigations. To summarize, many branches of medicine such as general surgery and gastroenterology are all confined to the abdomen. Since the introduction of polypropylene (PP) mesh for hernia repair, surgeons continue to discuss the use of mesh in a variety of settings for one of the most common operations performed by general surgeons—hernia repair. This discussion has involved raw materials, cost, and outcomes and for many years referred to only a few products, as manufacturing was limited. Nowadays, with multiple permanent, absorbable, biologic, and hybrid products on the market, the choice of mesh for a hernia repair can be daunting. Increasing clinical complexity further emphasizes the need for individualizing care, but more frequently, hospital supply chain personnel institute product procurement procedures for cost control, limiting mesh choice for surgeons. This can force surgeons into a “one-size-fits-all” practice regarding mesh choice, which may not be ideal for some patients. Conversely, current literature lacks definitive evidence supporting the use of one mesh over another, a fact that has not escaped the radar screen of the hospital supply chain and mesh industry, both of which attempt to limit vendor and mesh choice for financial gain. It is unlikely that this type of “proof” will ever come to fruition. This leaves us with choosing a mesh based on an algorithm that is centered on the patient and the patient’s unique clinical scenario. Operations on the gallbladder and bile ducts are among the surgical procedures most commonly performed by general surgeons. In most hospitals, cholecystectomy is the most frequently performed operation within the abdomen. Pancreatic surgery is less frequent , but because of the close relation between the biliary system and the pancreas, knowledge of pancreatic problems is equally essential to the surgeon. Acute and chronic pancreatitis and cancer of the pancreas are often encountered by surgeons, with apparently increasing frequency; their treatment remains difficult and perplexing. This review demonstrates the modern aspects of pancreatic surgery. Good study. A avaliação e os cuidados de feridas pós-operatórias deve ser do domínio de todos os profissionais que atuam na clínica cirúrgica. O conhecimento a cerca dos processos relacionados a cicatrização tecidual é importante tanto nos cuidados como na prevenção de complicações, tais como: infecções e deiscência. Como tal, todos os profissionais médicos, sendo eles cirurgiões ou de outras especialidades, que participam do manejo clínico dos pacientes no período perioperatório devem apreciar a fisiologia da cicatrização de feridas e os princípios de tratamento de feridas pós-operatório. O objetivo deste artigo é atualizar os profissionais médicos de outras especialidades sobre os aspectos importantes do tratamento de feridas pós-operatório através de uma revisão da fisiologia da cicatrização de feridas, os métodos de limpeza e curativo, bem como um guia sobre complicações de feridas pós-operatórias mais prevalentes e como devem ser manejados nesta situação. Como funciona o GRAMPEADOR INTESTINAL (SUTURAS MECÂNICAS) ? O objetivo do cirurgião ao realizar qualquer intervenção é que esta seja segura e eficiente. O procedimento deve ser o mais rápido possível, com o menor trauma tecidual, restaurando a função, e conseqüentemente diminuindo ao máximo as possibilidades de intercorrências no pós-operatório. A moderna cirurgia atinge estes objetivos de forma bastante satisfatória, porém, as complicações relacionadas às suturas ainda ocorrem com alguma freqüência. Foi somente no final do século XIX, que as suturas gastrointestinais adquiriram confiabilidade, com o conhecimento básico dos princípios da cicatrização dos tecidos. Os fatores envolvidos no reparo tecidual relacionam-se não só à técnica, mas também ao paciente individualmente, e à área a ser operada. A presença de isquemia, edema, infecção e desnutrição são alguns dos elementos que retardam e prejudicam a cicatrização. A variação na habilidade dos cirurgiões serviu de motivação para o desenvolvimento de dispositivos, que superando as diferenças individuais, permitissem que as técnicas fossem executadas adequadamente, e cujo resultado final fosse o melhor possível. Toda técnica deve ser reproduzida de forma confiável pelo maior número de cirurgiões para que seus resultados sejam adotados e reconhecidos como eficazes.